The majestic stage of the Royal Opera House’s historic auditorium. 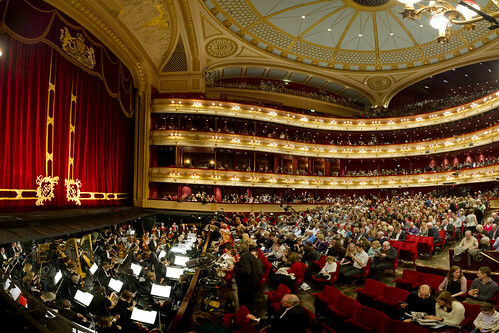 The auditorium of the Royal Opera House is the largest of London’s Victorian theatres. The current theatre, the third on its site in Covent Garden, was built in 1858 and designed by E.M. Barry. The auditorium seats 2,256 people, in a horseshoe structure modelled on the theatre design popular in Italian opera houses of the 19th century. 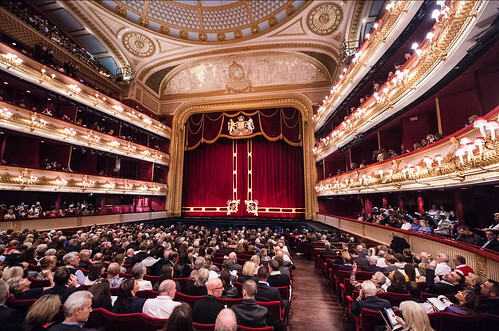 In the 1997–9 refurbishment of the Royal Opera House a number of innovations were introduced to the main stage and auditorium, though the overall structure has remained largely the same. These innovations included the new fly tower (a system for moving sets and equipment, now 37m high), designed in a classical style to match the rest of the building’s exterior. The proscenium arch of the main stage is 12.3m high and 14.8m wide and is flanked by gilded barleycorn twists. The inner twists can be adjusted to narrow the proscenium by up to 2m. The house curtains are crimson with gold trimmings and weigh nearly three tons. The performing area of the stage is 245.8m2. The orchestra pit, of an adjustable height, can accommodate up to 90 players. The main stage and backstage areas are operated by a ‘wagon system’ of moveable floors, introduced in the 1997–9 redevelopment. This allows some scene changes (within works or between productions) that take just 40 seconds. There are currently 21 wagons for opera and six for ballet, the latter with sprung floors. Friends of Covent Garden have the opportunity to purchase tickets to open rehearsals.